sold-through† and the game’s global subscriber base had passed 10 million, with growth across all major regions. Sounds good. 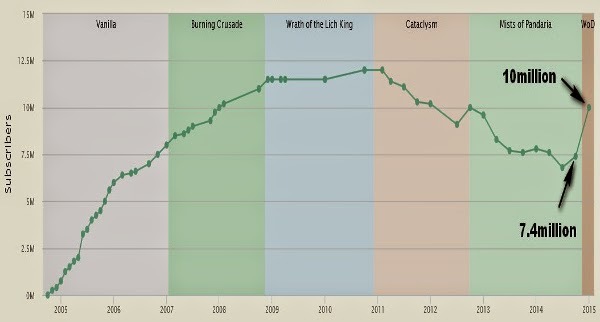 When you look at it graphically (thanks to MMO-Champion for the graph) it looks great too. When I heard this almost 3 weeks ago I was happy, the game I love is once again thriving. Launch day saw sales of the expansion pack hit 3.3 million, back in August it had sold 1.5million copies so between August and November 13th it sold a further 1.8 million copies and during that same period subscriptions rose 2.6 million. Assuming that ALL 1.8million sales were returners (unlikely) we’re looking at 800,000 new subscribers that haven’t ordered the expansion along with 5.9 million subscribers. Maybe it’s just me assuming that more people bought expansions on the day. One worrying thing is that, the servers came to a complete standstill across the US and EU realms with 3.3 million players trying to use them at once. According to WoWProgress, there are 120 US realms (counting connected realms as one realm) and 123 EU realms, this means that each realm averaged 13,580 subscribers that bought the expansion on or before launch day and the servers couldn’t cope with the demand. I wonder if this means that some connected realms could now be at risk of being over populated? What would happen? Especially if one half of the connected realm get over populated? This could have a crippling effect on guilds, especially on guilds that have the majority of their members from the sister realm rather than the realm the guild was formed on.